I have used GuruNanda before and love their products. I'm so glad to share this great giveaway. Give mom or anyone in your life (including yourself) the gift of essential oils and a great essential oil diffuser. Their essential oils are 100% pure essential oils from farm to shelf. GuruNanda's Essential Oil Diffuser is now available nationwide at Walmart. GuruNanda™ is a line of exquisite oils and diffusers designed to improve your health and well-being. Our aromatherapy products infuse your life with beautifully scented goodness for you and your family. The line of essential oils and diffusers are carefully developed and brought to the end consumer with a farm to shelf process. Our quality standards ensure that from seed to shelf, our essential oils are harvested and delivered to you with plants and flowers grown with exceptional care. We ensure the purity of every oil we blend or sell individually. Every oil and diffuser is designed to turn distress to de-stress. 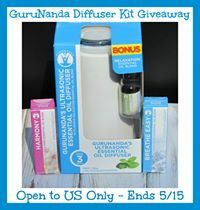 One lucky winner will receive a GuruNanda diffuser and two essential oils of their choice based on availability. Please note that the picture posted may not be the exact representation of the prize. The diffuser may or may not come with a bonus essential oil. I use lavender oil mixed with coconut oil on the kiddos when they get sick. I also put lavender oil in a humidifier. I use tea tree oil for scrapes and burns as well. The only oil I have now is peppermint. I use it in my homemade cleaning products and I sometimes mix a little bit of it inside my shampoo. I use lavender essential oil in a diffuser for mood therapy. Thanks for the giveaway! I use lavender oil mixed with distilled water in a spray bottle to freshen my bedroom because it is a scent that helps me relax and it smells so clean and wonderful to me! I use lavender oil in my bedroom to help me sleep and I use tea tree oil on scrapes and cuts. I love thieves and purify..I diffuse them both. Sheila M. I currently use lavender and mint for mood calming or energy. Looking forward to experimenting with oil mixes to repel insects. I haven't tried essential oil so I would have to do some research to figure out what I would want to try. I use a lemon oil to add to a sponge and leave setting on the bathroom vanity. It makes the house smell good for days. I would like to see a giveaway for some food safe essential oils in the future if you could. I would like to have cooking oils and extracts to use in the kitchen.